The holidays are upon us, and yes, it's time to start thinking about how you are going to make the coming Valentine's Day special for your significant other. There are many things you can do — buy them flowers, chocolates, take them out for a special romantic dinner, a bottle of wine, and so much more. But without our heart shaped sparklers, these ideas are nothing but the same-old-same-old. What better way to show your significant other how much you love them than in a glowing heart shaped shower of sparks? What Is Special About Heart Shaped Sparklers? 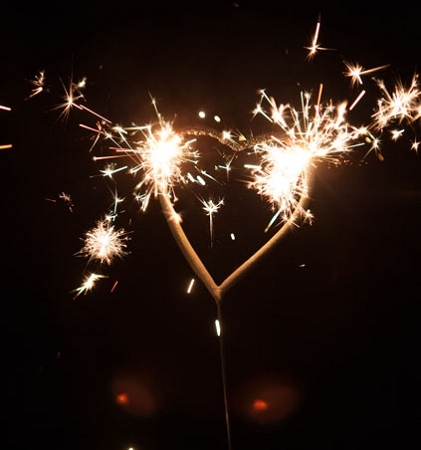 In essence, our heart shaped sparklers are just like our standard straight sparklers with the exception of the fact they have been bent into the shape of a heart. These wedding sparklers measure 11 inches long and will burn for approximately 60 seconds. They are perfect for virtually any romantic situation, from Valentine's Day to your wedding day. You can choose between sparklers that glow red when lit or the standard silver ones. Like all of the sparklers at Wedding Sparklers Outlet, these burn relatively smoke-free so that they can be used both indoors and outside. There are several ways you can use our wedding sparklers after your date night meal. For example, you could add a pair of the heart shaped ones to the top of a cake, light them at the end of a meal to celebrate your love or stop in the local park after the meal to take pictures of each other holding them aloft and making sparkling lines in the night sky with them. The more ways you can think of to share the burning of these sparklers, the more memorable the evening will be! How about lighting your walks in the park during the evening with several of our 36-inch long wedding sparklers? These massive sparklers come with an easy to light tip and will burn up to three-and-a-half minutes, lighting your way along the path and making for a very romantic stroll. If you plan to use several along the way, be sure you take the used rods back with you. No matter how you plan to spend Valentine's Day with that special person in your life, nothing makes for better memories than plenty of photographs. From photos of the smile on their face when you wake them up in the morning with sparklers in a vase next to their breakfast in bed, to photos of each other holding one of our heart shaped sparklers. There are dozens of ways in which you can use wedding sparklers to light up the photographs and turn them into memories you are sure to cherish for many years to come. Like all of the sparklers in our collection, our heart shaped models burn virtually smoke free so feel free to decorate the dining room table, share one on the breakfast in bed tray, or simply dance around the living room floor holding one together. All that really matters is that you share your love on Valentine's Day together. To see our complete selection of sparklers, visit Wedding Sparklers Outlet online.